(Nanowerk News) The carbon dioxide content of the atmosphere continues to climb and heat up the climate. The gas is, however, indispensable for plants, as they use the carbon it provides to form glucose and other important substances. Therefore, the more carbon dioxide the better? The equation is unfortunately not as simple as that. The plants, which ensure our basic food supply today, have not been bred for vertical growth but for short stalks and high grain yields. Scientists from the Max Planck Institute of Molecular Plant Physiology and the University of Potsdam have now discovered that an increase in carbon dioxide levels could cancel out the beneficial effects of dwarf varieties ("Action of gibberellins on growth and metabolism of Arabidopsis thaliana plants associated with high concentration of carbon dioxide"). 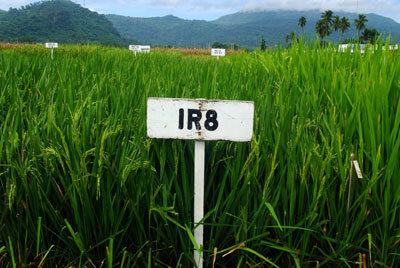 Dubbed as the 'Miracle Rice', IR8 was famous for its revolutionary high yield compared with other varieties existing at the time. Because of today's environmental conditions, IR8 is unable to produce the same yield levels. A variety of rice called IR8, which has now disappeared almost completely from the market, caused quite a stir in the 1960s. At the time, this dwarf variety of rice produced incredible yields and warded off the food shortages predicted at the time. While most other high-yielding varieties buckled under the weight of their grains, IR8’s strong short stalks had no difficulty in supporting its high grain yields. In addition, the plant saved on nutrients and energy through the lack of vertical growth and was even more productive as a result. Everything that was not required to grow longer stalks was made available to the rice grains. Plants like IR8 succeeded in protecting humanity against global famine and were hailed as part of the “Green Revolution” in agriculture. In the meantime, however, the yields from IR8 have declined by around 15 percent, and the cultivation of this previously very promising plant is no longer seen as worthwhile. To understand this development, it is necessary to know about the mechanism that lies behind dwarf growth in plants. The dwarf rice variety lacks an enzyme that is required for the production of the plant growth hormone gibberellic acid; without gibberellic acid, the rice plant remains short but strong and high-yielding. Although nothing has changed in the genetic makeup of the IR8 rice plant in the past 50 years, its yields have declined continuously. The researchers working with Bernd Müller-Röber from the Max Planck Institute of Molecular Plant Physiology and the University of Potsdam therefore wanted to find out whether this development was possibly linked with the global increase in atmospheric carbon dioxide levels. After all, the current concentration of the greenhouse gas in the atmosphere is 25 percent higher than in the 1960s. Using the model plant Arabidopsis thaliana (generally known as thale cress), the researchers were able to observe that a higher carbon dioxide concentration results in the unblocking of the capacity of dwarf plant to form gibberellic acid. The carbon dioxide appears to have the same growth-stimulating effect as that triggered by the gibberellic acid. Thus, in the experiment, the dwarf plants gradually lost their advantage and increasingly resembled the control plants. “Breeders now face the challenge of developing new plants that can continue to provide good yields under the altered climatic conditions,” says Jos Schippers, one of the authors of the study. The cultivation of dwarf varieties is not only common in the case of rice, farmers also prefer short-stalked varieties of wheat; both cereals are the staple food consumed by a majority of the global population. The researchers are now looking for the mechanism through which the gaseous carbon dioxide influences the growth of the plants.